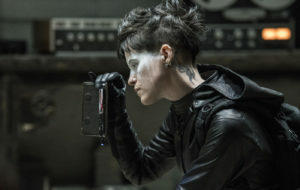 THE GIRL IN THE SPIDER’S WEB: A DRAGON TATTOO STORY is an awful title and a pretty bad movie. This marks a rather pedestrian outing for director Fede Alvarez (DON’T BREATHE; EVIL DEAD) whose movies tend to have a visceral punch, even if his talents as a filmmaker haven’t shined towards creating a satisfying story. Alvarez is a burgeoning filmmaker who is fully capable of bringing his own voice to a franchise. There’s a tone to his work that has the potential to burst into something special, even if his latest movie feels to be servicing James Bond for an unknown reason. The central character, Lisbeth Salander, is a fascinating figure in her own right – no need to pay homage toward that monolith. This is a movie that I can’t imagine many people are asking for, but hey, at least there is Claire Foy! Time’s arrow for how this story came to screen may be a bit wonky, but bear with me as we break it down: This is the third take on Lisbeth Salander, the world’s loneliest hacker. She possesses a special set of skills, but instead of roundhouse kicks, she relies on her wits that are without equal. The first iteration was played by Noomi Repace in the Swedish trilogy, and then by Rooney Mara in David Fincher’s THE GIRL WITH THE DRAGON TATTOO. And now she’s played by Claire Foy. All three actors disappear into the role, each has their weakness and strengths they bring to Salander, so any sort of partisanship is out the window. The acting is serviceable by its cast, which includes Lakeith Stanfield (SORRY TO BOTHER YOU), Sylvia Hoeks (BLADE RUNNER 2049), Stephen Merchant (LOGAN) and Claes Bang (THE SQUARE). Alvarez confidently handles his action set pieces, and yet THE GIRL IN THE SPIDER’S WEB is about as delicious as a bagel without any cream cheese. Sure, the goods are there, but there’s a complete lack of flavor that needs to be at the forefront of a film with this much intrigue. Problems arise at the script level, which was penned by Alvarez, Steven Knight (LOCKE) and Jay Basu. 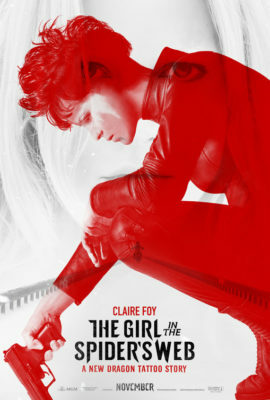 What starts as a labyrinthian path into NSA analytics and programming algorithms, with a bit of Russian espionage peppered in the mix, turns into a “heartfelt” look into Salander’s past and her relationship with journalist Mike Blomqvist (Sverrir Gudnason in a bland performance). SPIDER’S WEB sets up a cat-and-mouse dynamic between Foy and Stanfield that adds some cleverness here and there as well as gives Foy a chance to showcase her skills as a sleuth; however, the narrative punches that follow merely warrant a shrug of the shoulders. Maybe it’s because this level of depravity feels completely unearned, or maybe that this particular brand of morose behavior has worn out its welcome. Not to dwell too much on Fincher’s 2011 version of DRAGON TATTOO, but that film had something to say about man’s disgusting behavior towards women. This film slightly uses that theme of the series to create a teaser trailer. A few hours after watching THE GIRL IN THE SPIDER’S WEB: A DRAGON TATTOO STORY there’s very little that can be recalled. This is the kind of film that passively enters my brain and exits with the faintest hint of a whisper it was ever there. Let’s hope this is a slight wakeup call for Alvarez, so he can rediscover the umphh that gave him his spark back with 2013’s EVIL DEAD remake. Also, if you have any jokes regarding this ridiculous title, kindly send them my way. THE GIRL IN THE SPIDER’S WEB: A DRAGON TATTOO STORY opens nationwide on Friday (11/9).